Yesterday I complained to my dear friend, Kendall, about my dogs. I told her that they absorbed my day with their various needs and demands. I lamented the fact that I never take walks without both dogs attached to my arm. In fact, only when I go to Paris. All of this sounded pretty ridiculous when I said it out loud, but she had sympathy for her silly old friend, having recently adopted a darling and totally absorbing poodle named Lambie (she has her own blog). These days we do tend to speak of our dogs: the problems and the joys of parenting dogs pour forth and are made more acceptable and less ridiculous by sharing. We continue to mirror one another and remind one another that we are as human as we are spiritual in nature, and it’s OK – even quite wonderful to love our dogs. This post is – in part – inspired by our recent exchanges. I feel moved to express my gratitude for my canine companions. Music is a red and white cocker spaniel with a perfectly round dot on top of his head. I call this an angel’s kiss, which might go far toward explaining his rather angelic demeanor, at least when he’s in a peaceful mood. Relaxed and drowsy on my bed – or when riding beside me in the car – his gaze can be so over-flowing with love that I have to respond in kind. Any negative energy in the vicinity is banished immediately by Music’s love-eyes. 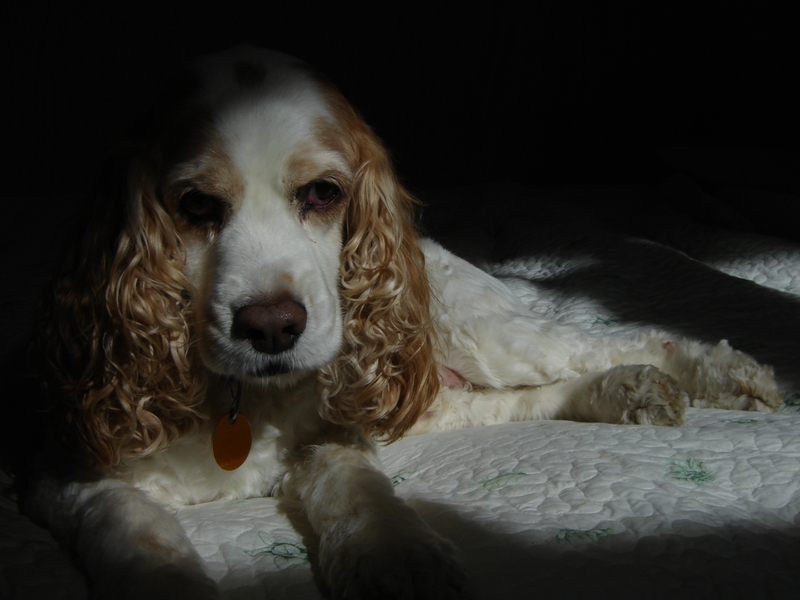 Of course, even an angel of a dog has a devilish side, or should I say stubborn side. When his nose is in gear and he sniffs out the odorous presence of racoon, fox, or who knows what other tantalizing scent, he becomes a dog possessed – takes off like a streak, forgetting any intention to stay close to the one he loves above all else. My voice – calling sweetly at first, then louder and increasingly commanding – has no effect. His ears are closed the minute his nostrils flare. My frustration and anger mount as Music disappears further into the woods, and only when he is stopped by the briars does he come to his (higher) senses, becoming submissive enough to be rescued. I am the rescuer, also the briar remover, the tick drowner, and the one who hoses the stinking mud from his beautiful coat. I am also extremely angry until those eyes are turned on me once again: those beseeching – I love you, no matter what – eyes. Music also sings: a loud lament that tells me he needs – immediately and desparately – to be let in off the porch. He also sings when I leave the house without him. The singing seems to be brought on by separation anxiety, but it could be simply a talent for singing the blues. Music is twelve-years-old. I have been graced by his inimicable presence for nearly as long. 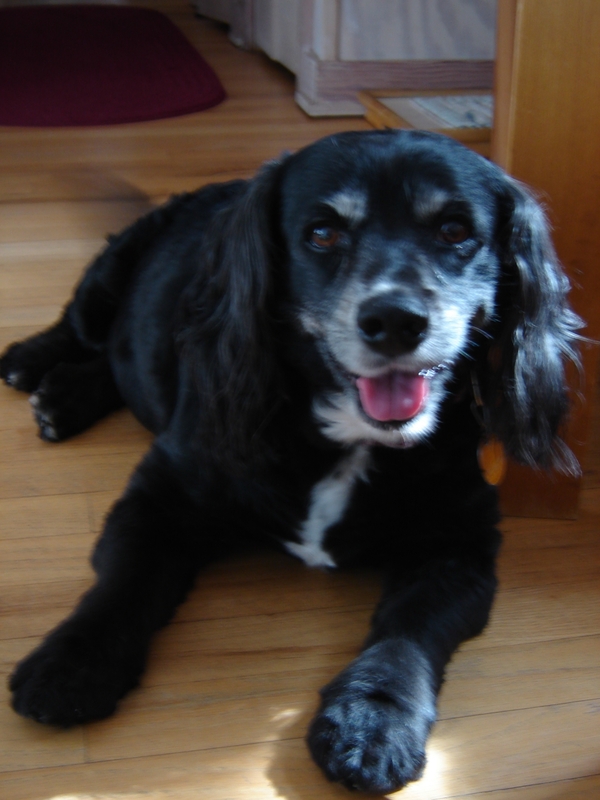 Star is a happy little cocker/beagle mix, brought home because Music needed a friend – or so I surmised. For the first week of her presence in our home, I thought of her as a foolish mistake. I am pretty sure Music felt the same way, and we came pretty close to giving her away to the Wisconsin Christmas tree man. I couldn’t do it. Puppy Star was cute and round and endlessly affectionate – generous with wet sloppy kisses and eager to leap into the nearest lap and stay for a while. She is still all these things, though ten years later – at thirty-two pounds, her lap-leapings can make a startling and weighty impression. Star is a hungry dog – all of the time and for anything, edible or questionably so. My love for this little dog tells me that she has an appetite for life. My horror at her occasional partaking of cat poop tells me she is an indiscriminate eater with a few nasty habits. Her beagle side requires frequent baths and liberal applications of deoderizing spray. Despite her extra weight, my Star can run like the wind. She can also dance, when in the mood. She and I only dance together in private. This is usually when Music is happily ensconced on the porch watching out for racoons. Yes… Another angel has moved through my hands to completion. Her gesture is reminiscent of Isadora Duncan: The torso twists into opposing directions. In the drawings of Isadora, the gesture is beautifully balanced. As I hung my angel before the black cloth for photographing, she seemed indecisive. Even the little bird appeared confused to my demanding eye. “Which way are we going?” she seems to wonder. I wondered with her as I tweaked the wire in an effort to find some answer that would solve our quandary. But the angel knew she was complete. She was happy to sashay this way and that. She enjoyed the presence of uncertainty – the freedom to be just off the mark, or possibly with no mark at all. She will dance where she is and keep everyone guessing, especially her ever-questioning creator. Finally, I accepted her as she was – a quirky sort of spirit expressing the ambiguity of both of us, and possibly – with Isadora’s help – a balance that I can’t quite see. 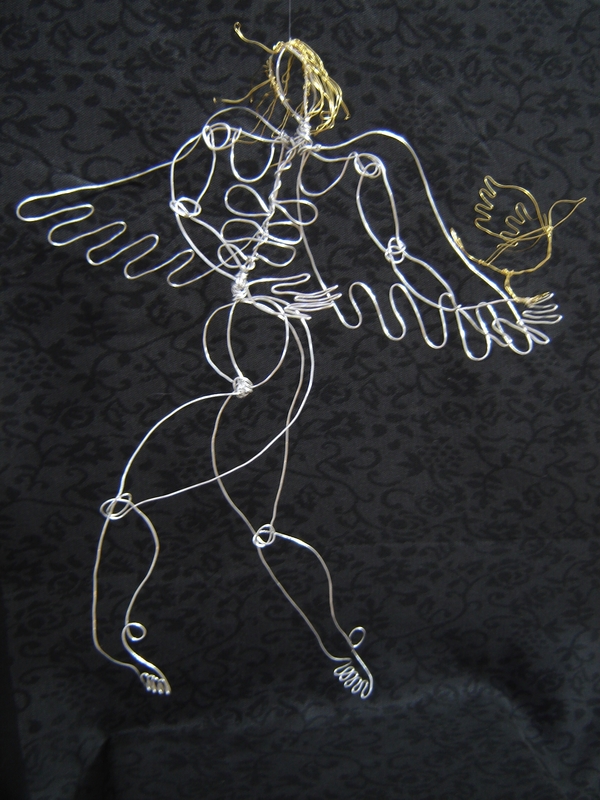 I completed this requested angel on Sunday night, attaching a delicate butterfly as a traveling companion. It has been clear from the beginning that this particular angel would be a traveler – that her gesture would carry her swiftly away from her origins. I was letting her go even as I made her, but I didn’t count on the effect of her rapid departure. She left on Monday, and today I face the feeling of having been left behind. I normally keep my creations for longer – give myself time to receive their message before they leave me. This time she flew from my hands before I had time to know her, or to realize myself through her expression. Thank heaven for the photograph I paused long enough to snap. Now I look at the vibrating stillness that gives power to her flight, and I sigh with gratitude even as I grieve her eagerness to fly from me. But didn’t I give her the eagerness for her particular journey? The awareness that she was wanted before I approached the wire – aroused an impetus within myself that freed her gesture. I gave her movement and the will to move beyond her making, and by so doing, moved beyond whatever personal hesitancy I feel at going forth. And then, there is the butterfly, attached just prior to her taking off. It rests upon the little finger of of the angel’s trailing arm – seeming to have hitched a ride at the very last moment. 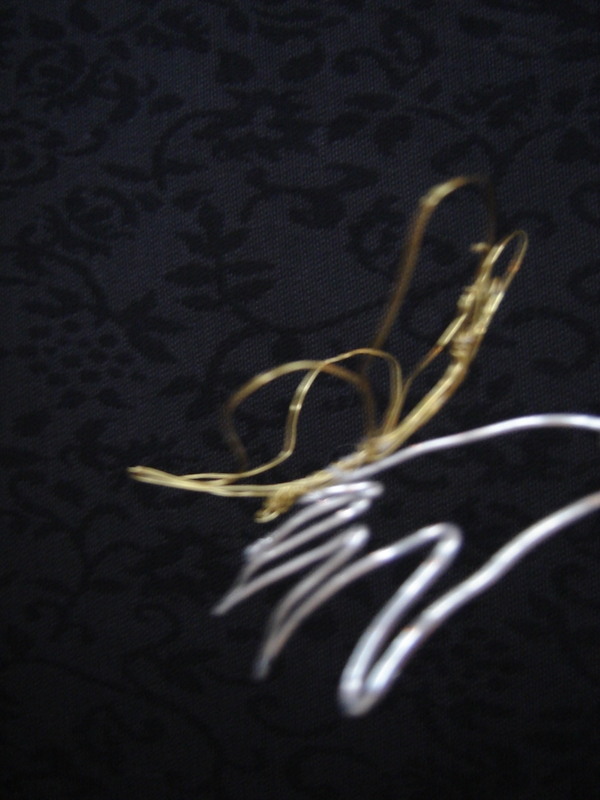 The angel probably doesn’t need this tiny passenger, yet such a weightless pressence could never hinder, and perhaps the smidgeon of golden wire contains a hope that I am a traveling too – beyond my origins. A few days ago, while walking the dogs, I came upon a Great Blue Heron standing on a half-submerged bicycle wheel in the inner harbor. At first I was simply entranced by the beauty of the bird, a contemplative creature, so still – so perfect in its stillness. It breathed me into its world and held me there, even as it had no interest in my presence – nor in that of the cars that intermittently passed on the bridge overlooking the inlet. I gazed until I was tugged a little further forward by my dogs. Then I looked again and was even more entranced. The wheel and the wheel’s reflection had formed a heart that linked the heron with its watery mate. We continued our walk, but I couldn’t get the image out of my mind. Arriving at home, I grabbed my camera and drove to the bridge and parked. 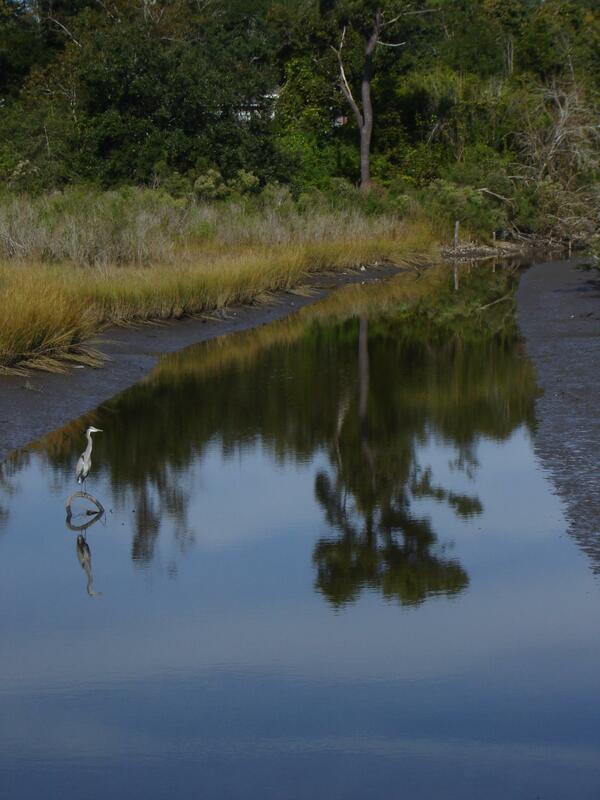 The heron and its reflection were still there. I took several shots in hopes that something of the magic would survive despite my inadequate camera. The heron, the heart, and the heron appeared so small, while their effect upon me was so large. I worried that the surrounding landscape would swallow the magical message I had received if I tried to share it. I needn’t have worried. Today I spoke with my dear friend Kendall on the telephone and as I relaxed into the loving ambiance of our connection, I found myself telling her of the heart that united the heron with itself. I told her that I had wished for her and her photographic skills and felt reluctant to post my inadequate photograph. Her response to the image – without seeing it – made me wonder it my attempt was more successful than I realized. I also felt that even as we spoke I was experiencing what the image meant to me. Our connection is a life-long one. Begun in childhood, it has survived a lifetime of mutual and separate experiences. There is a heart at the core of our relationship that links us infallibly with one another. At times I am her reflection – showing her what she needs to remember about herself , and at times it is she who gives me back to myself. In those moments when one or the other or both of us is feeling lost and disconnected, a phone call or an email or a blessed face to face encounter can restore the truth. The heart we share becomes a palpable, nearly visible reality which lets us see once more the beauty of existence. Her beauty… My beauty… It is all one. The changes brought about by living can only bring it into sharper focus, and the image we show to one another is always and forever – acceptable. The Southern Expressions Author’s Conference is over. A pleasurable and exhausting two days has left no lasting effect that I am aware of. All I feel is a need to move on – do what I can to get MEANT TO BE ME (A Dancer’s Story) in print, even if I have to do it myself. Life is good. I enjoy my various creative pursuits, and life is good. Yesterday – after the conference ended at noon – I walked downtown to The Peter Anderson Festival. I was tired, but wanted something more from the day. A slight melancholly accompanied me as I threaded my way through the crowds past booth after booth – displaying every imaginable craft. Hard work was apparent in many: wood carving, pottery, jewelry, woven goods. Som people work all year in preparations for these festivals, most of which take place at this time of year. I felt for the makers, thinking of expectations and seeing the enormous amount of competition. Would any of them sell enough to make it worth all the effort? Some individuals were lively, hawking their wares – old world style, while others sat back in lawn chairs looking tired and resigned. At least the air was on the chilly side. I’ve known many a festival when the sun turned the vendor’s faces a painful pink, and the attendees grew more plaintive as the day wore on. I was not in a buying mood – felt slightly guilty for it – and was only briefly tempted by the warm, sweet aroma of cinnamon-roasted pecans. Instead, I walked on to Realizations ( The Walter Anderson Shop) to check on whether my own creations had sold. They hadn’t, and I had to retrace my steps down Washington Avenue, braving crowds again when I’d begun to long for invisibility. 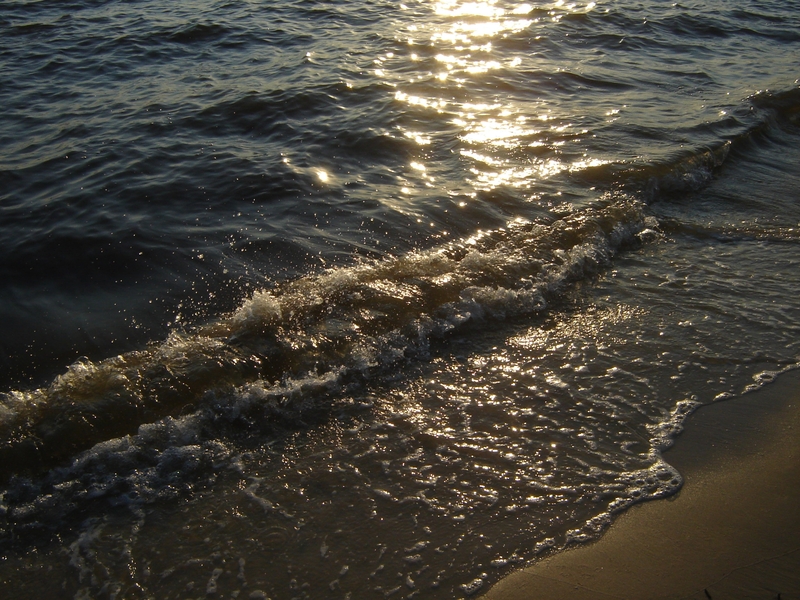 A few times I was recognized and stopped, was engaged in effortful small talk before resuming the flow that carried me to the Ocean Springs Community Center and the OSAA show. It was peaceful inside the old building, though many meandered down this aisle and that, absorbed by the art. I found no red star by my angel, though she looked her best with the sunlight glinting on her wings – was apparently accepting her place on the pedestal by the door. I forced myself to disengage and walk further into the room amongst the art of others – barely seeing pieces I’d seen before. What was I looking for? Certainly not for bantering exchanges, yet these I found and briefly engaged with half-hearted friendliness. I was ready to leave, suddenly craving solitude and rest. I wasn’t looking for anything anymore, but glanced at my angel and saw the shiny red star indicating a sale. “When did that happen?” I asked the woman at the desk. “It is happening now,” she said, gesturing toward a young woman writing a check. “…and she wants another.” Apparently, she had been there the day before with her sister, who had fallen in love with the angel. She’d returned to purchase it as a Christmas giftfor the sister, but wanted one for herself , as well. I spoke to her of the angel’s fragility – the malleabilty of the wire – and the need for careful handling. Her soft brown hair framed her delicate face and her soft brown eyes looked into mine. I had found what I sought when I ceased the seeking, and all was well. The winged horse teased me for over a week. 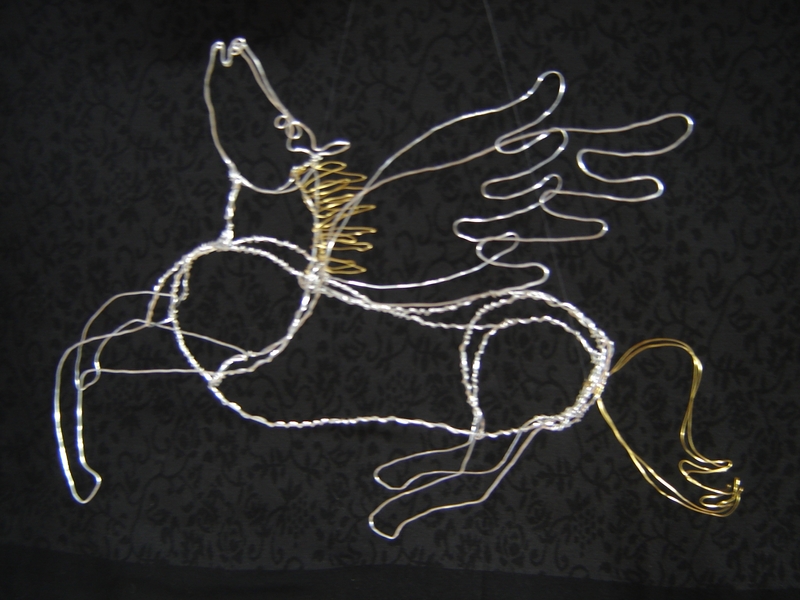 First by resisting my every attempt to shape the wire into something even vaguely resembling a horse. I refused a photograph, though I admit to watching my favorite part of the movie “Black Stallion” ( the scene on the beach with the boy: the bonding scene). That was the night before I took wire in hand and began the attempt. I wanted essence of horse as a wild, barely knowable creature – a powerful mystery. The addition of wings were bound to call forth the mythological “Pegasus”. This too I refused. I wanted a new and uncatagoried creature. Horse, but not horse; a being heroic in nature, yet flawed. I don’t do perfect. I have always stubbornly embraced the beauty of imperfection, but as I struggled with the wire and realized the oddity of form that began to emerge, I knew I would have to work as hard at acceptance as at shaping the wire. The temptation to predict my failure was picking at my brain, closing my throat, making of my hands a bloodless battlefield. My fingers warred against one another, Every believable action was countered by a destructive element. Each graceful line was undone by the line that came after. Or so it seemed at the time, as I persevered, disregarding the awkward and messy appearance of things. How desparately I wanted to leave the field – to cease my effort – to throw down the gauntlet, heroic gestures be damned. Yet I finished the dance, for it always comes down to a dance for me, and I’m not going to stop until the dance is over. I know; I am mixing my metaphors. First she’s on a battlefield, then on a stage. Perhaps they are not so different after all. In the seventies, I made so bold as to dance to Beethoven’s Eroica Symphony, donned a purple tunic and the spirit of Isadora, and commandeered the shining floor of the Ocean Springs Community Center. I was one small impetuous figure presuming the right to share the space with Beethoven’s genius, not to mention my father’s, whose brilliant murals danced on the walls behind me. I marched, lunged, and stood still in a pose of conviction, believing in the woman warrior in myself. I could go forth and conquer the enemy that would suppress my freedom of expression. At that time in history feminist warriors backed my every movement. It was the best of times for women who saw themselves as heros. Oh yes, our gestures were stymied and fought against. Our opponents were hurt, confused, and fearful of losing control. But our dance was mighty in effect; it was long over due. So last week I thought I had finished the particular dance that was trying to evoke a winged horse. I hung it against the black cloth that showed all of its flaws in stark relief. I looked at it with a critical eye and thought it not good enough to present to the public eye. 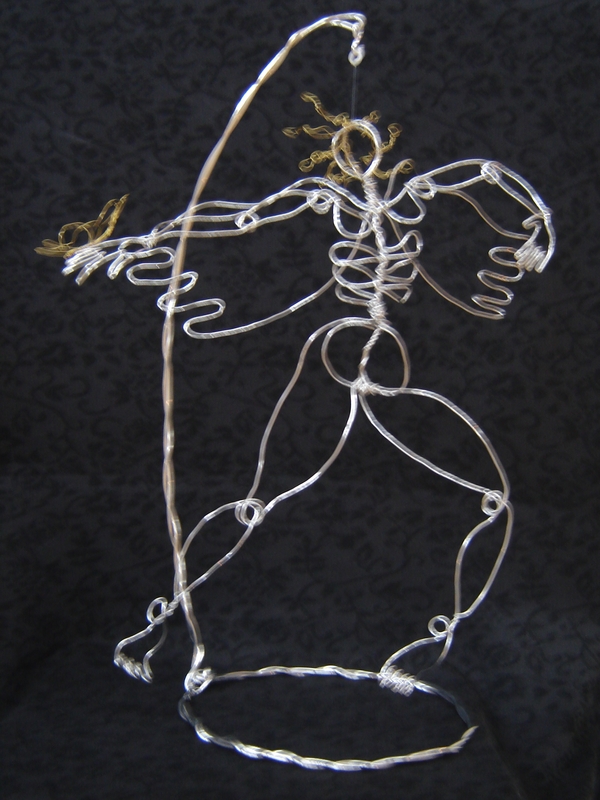 I pretty much dismissed the beauty of its imperfections, until last Friday when my grandson called it “…my favorite of all your wire sculptures, Nanny.” In a flash I saw it with a generous eye. I saw the gesture of the horse as lively, joyful, and yes, expressing a heroism that is apparent to the unpredjudiced eye of innocence. I realized the dance wasn’t over. I took her lovingly and carefully into my hands, believing in what I had seen with a ten-year-old’s help: the heroic gesture. I had also seen that the long curving lines of the torso needed re-enforcing, so I doubled the wire of the torso, bravely twining the new wire around the existing wire. I had to be firm in my intent, even as I trusted the power of the initial gesture. What had seemed flimsy before, assumed a sturdier more substantial reality. A few delicate adjustments, and she was ready for the stage again. Now she galloped, glorious and free, against the dark cloth that defined her stage. Imperfect, yes – but definitely heroic in her dance – determined to dance on. You are currently browsing the A Dance of Balance blog archives for November, 2010.